For the past five years, I have been working on the impact, relevance and transformation of post-secondary education. 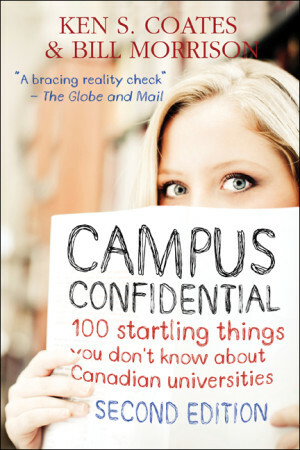 My book with W.R. Morrison, Campus Confidential, attracted a lot of public attention, offering an affectionate critique of Canadian universities. We are now publishing a new book, aimed at high school graduates, called So, You Want to Go to University (to be published in 2014). We are also working on a book on global post-secondary expansion. Our work on universities examines the changing role of universities, student expectations and outcomes, the effectiveness of academic research and commercialization of research, and the role of international students. We have argued that there is a growing disconnect between university education and the job market, resulting in widespread underemployment. We are also concerned about the shifting university experience and the financial viability of many institutions. Put simply, we argued that universities have expanded too far and too fast, that many under-qualified students are enrolling in universities and that many graduates are experiencing unexpectedly weak employment outcomes. On a global scale, the rapid expansion of universities around the world – particularly in East Asia, South Asia and the Middle East – has saturated the global market for university graduates, exacerbating the employment challenges of those with university degrees. Government preoccupation with university enrollment, more so than college and polytechnics, has made the problems of over-enrollment even worse, much to the chagrin of Canadian employers, many of whom face serious problems finding skilled and specialized employees. We anticipate that the next decades will see major changes in universities and post-secondary education, not the least from the emergence of digital learning, MOCCs and global universities. What to Consider If You’re Considering University: New Rules for Education and Employment (Toronto: Dundurn, 2014). With Bill Morrison. “Reinventing Universities: Continuing Education and the Challenge of the 21st Century,” Canadian Journal of University Continuing Education 39, no. 1 (2013) pp. 1-12. “The Re-Invention of the Academy: How Technology Mediated Learning Will – And Will Not – Transform Advanced Education,” Cheung, S. et al, eds., Hybrid Learning and Continuing Education (New York: Springer, 2013), pp. 1-9. “Founding of the University of Northern British Columbia,” The Northern Review, #27, 4/20 (Fall 2007).